Team of refugees will compete in Olympics. 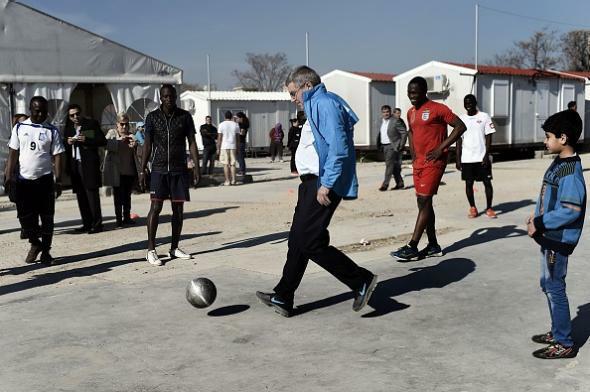 International Olympic Committee President Thomas Bach at a migrant and refugee camp in Athens on Jan. 28. This summer’s Rio de Janeiro Olympics will feature an independent team of refugee athletes, International Olympics Committee President Thomas Bach has announced. Bach says that the IOC has already identified 43 refugee athletes with the potential to qualify for Olympic competition and expects the final “Team ROA” (Team of Refugee Olympic Athletes) to consist of between five and 10 individuals who will march together under the Olympic flag in the games’ opening ceremonies. Athletes that have lacked national affiliations for various arcane political reasons have competed at previous Olympics as independent entrants; this is, however, the first time that refugees—i.e. athletes whose home country has an active, eligible Olympic committee that they’re unable to compete for because of displacement—will compete. The IOC says that it’s gathering information on potential Team ROA members through national committees and refugee camp authorities. The Rio Olympics begin Aug. 5.